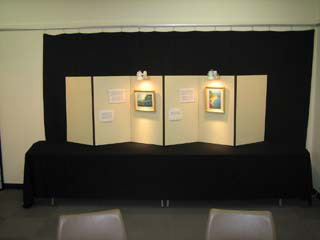 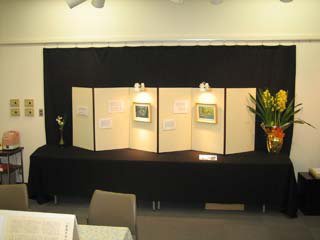 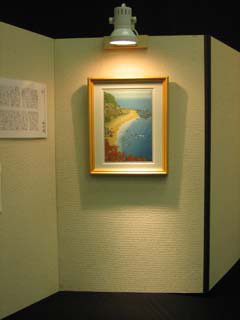 Over against the right wall, where the display with the scroll was located last year, are the first two prints from the 'My Solitudes' series, with Kato-sensei's flowers next to them. 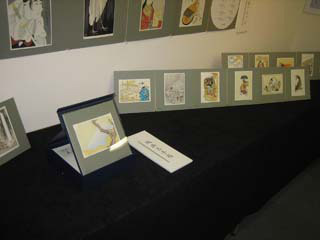 I usually put the prints up on these panels accompanied by their 'stories', but that is not possible this year, as the stories are real stories ... about 10,000 words each. 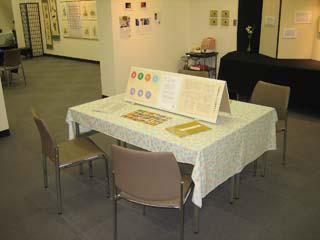 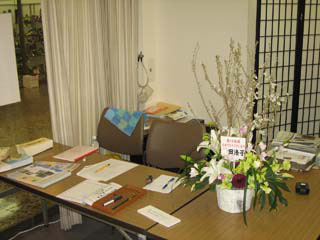 So instead, I prepared a table in the centre of the room, where there are four sample books that guests can sit and read. 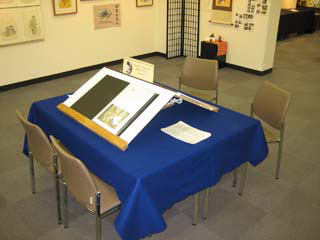 The table also has a display stand with information on the series. 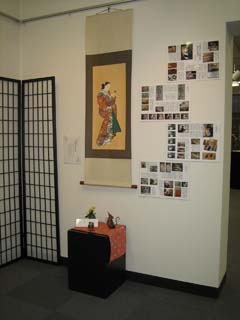 On the wall beyond, you can see a selection of clips taken from television programs on my work, and the entrance to the second room. 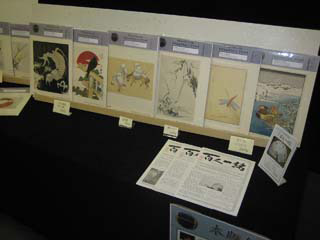 And next to that, tucked into the corner, is last year's scroll print, along with a series of panels illustrating its construction. 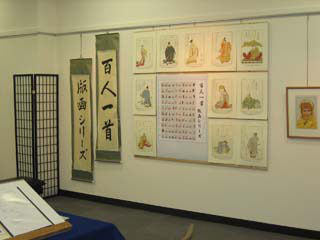 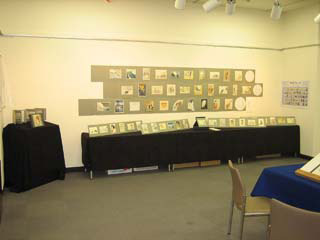 Over on the opposite wall are a selection of prints from the Surimono Albums, and a long table with the entire 24 prints of the Hanga Treasure Chest laid out on it. 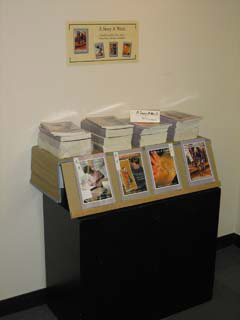 Here's the 'A Story A Week' corner, with four books now in print. 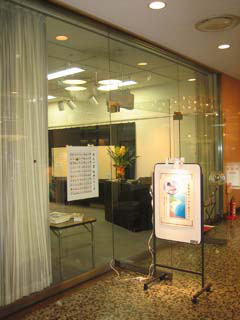 And this year - for the first time - the Mokuhankan shop sold more books than prints! 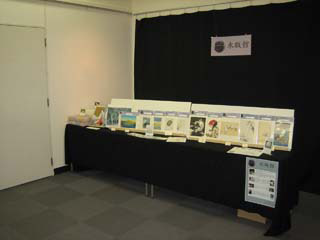 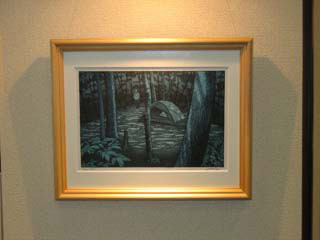 Down at the back of the room, in its regular spot, is the Mokuhankan shop, with the selection of single prints for sale. 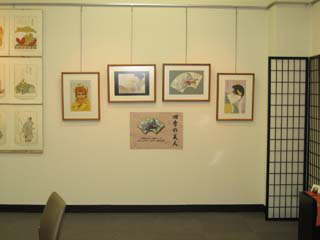 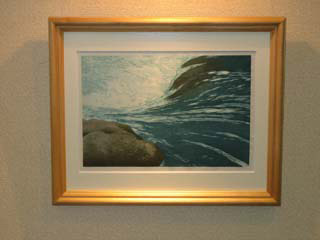 This year, for the first time, prints from my own sets are now appearing in Mokuhankan. 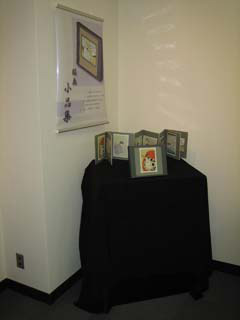 The ones here are from my first Surimono Album, which is now 'out of print' in my original edition. 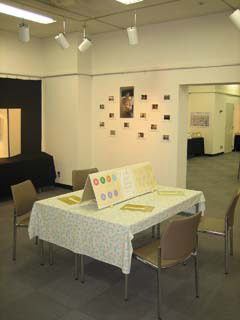 And ... if we zoom back up to the front of the gallery, we can see something that I skipped earlier - I have a demonstration space set up. 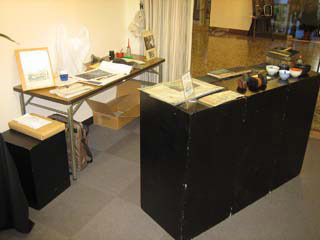 It's not like my usual printing bench, but just a block and a few tools on a stand where people can watch as I pull copies of the image I used as this year's new year print. 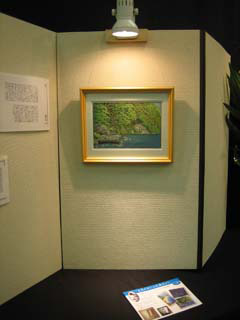 And we sold them 'hot off the press' ... for the sale price of 2500 yen.